Over the next few days, I'm going to be writing my thoughts on the Hunter Class Preview blog over on battle.net. If you haven't read it yet, you can read the article in its entirety here. I'll be working through the specs in the same order they were presented in the preview, so let's get started with BM. The theme for the development of Legion, thus far, has been "class fantasy". For BM, they've laid out a fantasy that I can mostly get behind. From an RP stand point, I'm a big fan of being invigorated by the untamed beasts fighting along side me (which is technically spelled out as Dire Beasts' increasing my focus). The only real problem I have with that is my pets should be closer to me than family. Taking Rexxar as the prime example, he's not, as far as I can tell, just attracted to the danger of wild animals, but really loves and cares for his animal friends (which we got a great glimpse of in his quest line from Gorgrond in Warlords of Draenor). When I play a hunter, I'm not just using these animals to hurt my enemies; I'm developing a relationship with them. A quick shot that causes moderate Physical damage. Summons a powerful wild beast to attack your target for 8 sec. Each time the beast deals damage, you will gain 4 Focus. Summoning a beast reduces the remaining cooldown of Bestial Wrath by 15 sec. 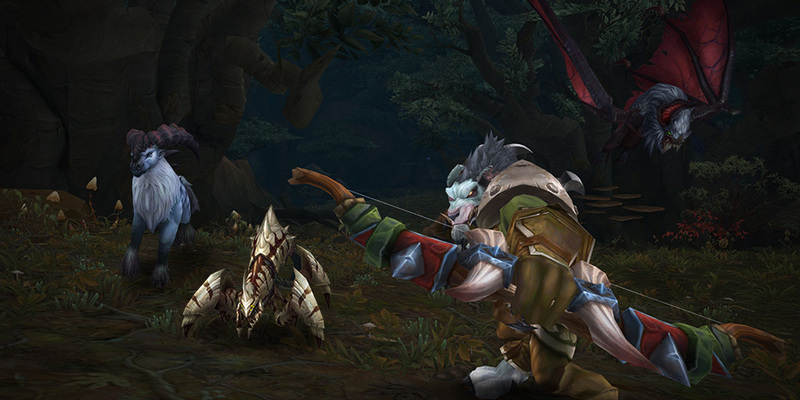 Give the command to kill, causing your pet to instantly inflict strong damage to its target. Your critical strikes have a 30% chance to reset the cooldown of Dire Beast. Increases the damage done by your pets. For every pet or guardian you have active, Cobra Shot deals an additional 5% damage. This of course wasn't an all-inclusive list, and was just meant to give us a taste of what BM might look like. The most drastic change, of course, is what we discovered last Saturday at BlizzCon, that Cobra Shot has become the new Focus Dump, and Dire Beast will be the only option for "active" (ish) focus regen. Someone on the WarcraftDevs twitter account also tweeted that there would be a 67% increase to base focus regen. I'm trying my hardest not to simply panic because I'm terrified of change. I do have some concerns about losing the old Cobra/Steady/Focusing Shot, though. Let's start with some basics, I like high APM (attacks per minute), high movement classes. BM and SV have given me the exact playstyle I love for a long time now. So my first concern is that we'll have down time. I recall when perhaps warriors or DKs were given some downtime in their rotation, the devs' response was that downtime was ok, and could make for interesting playstyle. That is totally fine, I have no problem with there existing specs in the game that have downtime in their rotation. I, however, am not interested in playing a spec like that. The primary explanation was that we would now be more directly managing our pets during the time we used to cast cobra shots. I am perfectly happy managing my pets between GCDs. In fact, it's the only thing that makes BM PvP even the slightest bit interesting (I'm not the biggest fan of BM PvP, but it at least gives me something to think about). The other big factor, is that active regen abilities just feel good to me. I realize that with proper planning, a really good feral druid/rogue can increase their burst on priority targets, and there are lots of little things you can do to make yourself more useful. But that is a hunter's bread and butter. It's why we're so covetted in high-end raiding right now, despite not being able to put out the over-all dps other classes can; by pooling our focus and dumping it at the most opportune time, we can do incredibly important DPS to the highest priority targets. Again, I'm fine with other playstyles existing--I don't think there's anything inherently wrong with specs that wait for their resources to regen passively--I'm just not interested in it. I like the feeling of building up focus because I know there's an add about to come out that I want to unload on. I enjoy the mini-game of balancing my focus at higher or lower points depending on how soon Bestial Wrath will come off CD, or Barrage, or my Legendary Ring, etc. What's important about that to me, is that it feels like I'm doing something, not just waiting for my resource to refill. Perhaps that is completely in my head, and in all actuality there's very little difference to your rotation when you have a fast passive regen with no active regen ability, and a slow passive regen with active regen abilities. I'm simply saying for me, active feels good. I should clarify one other thing. Since saying something "feels good", is fairly generic, I thought I could explain one thing that I really like about current hunters. That is: no one has been able to create a macro or bot that can do better than I in a real raid situation (this would be even more true for some of the many, many hunters out there who are much better than I). The reason that's the case, is there is a lot of subtle decision making in hunter's rotation. With the new Dire Beast, because casting DB reduces your CD of Bestial Wrath by 15 seconds, there's basically no time you will not cast it on CD, meaning no choice your rotation. With that said, I do like the idea of increased resource regen when I have more pets out. Dire Beast is a good ability thematically. I only wish there were a way to make it feel like it was something active I was doing. "Will be some very active talent options for focus generation to make up for this if you need it." I love this talent. I enjoy anything that changes the value of your abilities mid-fight, causing you to have to react with changes to your rotation. I also really like it because it's value will be different depending on what gear you have. A trinket like Mirror of the blade master might completely change whether or not you take Way of the Cobra, or it might be an unattractive talent at the beginning of a tier, but once we get another extra pet from some set bonus, it will become more valuable, again. From a progression raiding standpoint, this is primarily an increase to your CDs. Giving you a way to increase your burst damage (as generally for BM, the times we have the most pets out are when we're bursting). This could make it very valuable for kill priority targets, or just giving a higher opener burst on more patchwerk style fights (that's 20% extra damage for cobra shot during Stampede, BTW). Also, depending on crit levels you may see a lot more use out of this ability, as you start to see more Dire Beasts at the same time. One things that seems clear for all three specs, is we're looking at some very RNG-dependent rotations. For BM, we have the Wild Call ability, which has only a 30% chance to reset your Dire Beast CD when you crit, allowing you to reduce the CD of Bestial Wrath by 15 seconds. If you have 25% crit, that means each ability has a 7.5% chance to reset DB. That's low enough you may get unlucky streaks where you never see it during a fight; though if you're lucky, you may be constantly casting Dire Beasts and Bestial Wrath. The DPS distribution from so much RNG will be fairly extreme unless they add something to balance things out. Overall, I can appreciate the direction Blizzard is taking BM hunters. I had been hoping, that because SV and MM were getting complete overhauls, they would leave BM close to what it had been before. That turned out to not be the case, and hopefully I don't miss the old hunter class too much. A concern that I've heard several people voice, is that BM set bonuses tend to always be the same. I can't remember how many times we've had a set bonus that was "summon a pet when you use x cooldown." With the increased focus on the beasts of BM huntering, I hope they can think of a more interesting set bonus every once in a while.